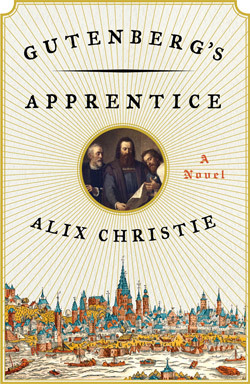 Next week, my debut novel “Gutenberg’s Apprentice” will appear like a Deus ex machina above the HarperCollins stand at Book Expo America in New York. I imagine the cover suspended above the Jacob Javits Center: enormous, backlit, glowing .The series of events that led to its appearance there is nothing short of miraculous. I’ll be sharing some of that process in the coming months on this blog, leading up to the book’s publication in September. How my book began is also a story about how all books began before 1450: with an implement held in the hand. Even now, what book does not begin with a scribbled note? There is a sudden collision of ideas, a chance encounter in the world, an article, a sight. We grab a quill, a pen, a tool, and write. 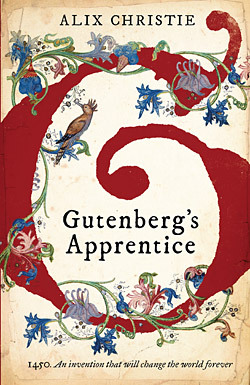 My novel tells the story of the last great transformation in the life of books: the invention of printing in medieval Germany. We stand again at such a moment, 560 years after the invention of movable type. 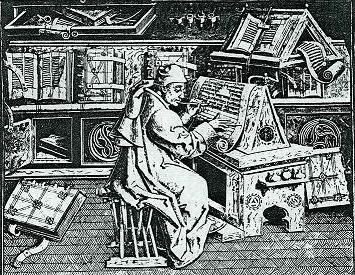 I can’t help but notice, though, how much we still look like medieval scribes: hunched not above a manuscript in a scriptorium, but in cafés above our shiny laptops.